Today Rob Mitchell explores Lord Broghill, one of the area’s most notable past residents and former owner of Ballymaloe House. Roger Boyle, the 1st Earl of Orrery was born 25th April 1621 in Lismore, Co. Waterford. Boyle was the third surviving son of the famous Richard Boyle, 1st Earl of Cork. His mother was Catherine Fenton daughter of Sir Geoffrey Fenton of Dublin. Roger was named after his parents’ first son who died at the age of nine. He was created Baron Broghill on 28th February 1628. Roger Boyle became best known as a soldier, making his reputation during the Eleven Years War of 1641-52. He was also a dramatist and politician, and he regularly sat in the House of Commons between 1654 and 1679. When war erupted in Ireland in 1641 Boyle returned to Ireland from his travels in Europe to help suppress the rebellion. It was in the same year that Ballymaloe passed to Boyle, part of an association which lasted for thirty-eight years and saw the construction of the west wing. In 1642 Boyle fought with his brothers for the Government forces in their victory of the Confederates at Liscarroll in north Cork. The outbreak of the English Civil War left men like Broghill with a choice to make- King or Parliament. Broghill elected to side with Parliament, and he served publicly until the execution of King Charles I in 1649. After this he retired from public affairs and settled in one of his residences at Marston, Somersetshire. Broghill appears to have been uncomfortable with the execution of the King and was suspected of trying to bring about the restoration. However Oliver Cromwell offered him a command in Ireland to help bring about the end of the war there, and Broghill accepted. During the ultimately successful Irish campaign Cromwell stayed in Ballymaloe, and Broghill played a key role in crushing the Confederate cause. 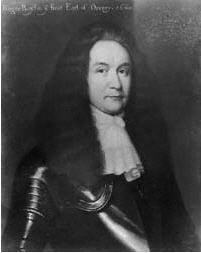 Broghill helped to secure Ireland for the King on the Restoration in 1660, and was rewarded by being created the Earl of Orrery. He also became a Lord Justice of Ireland and drew up the Act of Settlement. He spent most of his time at his estate in Broghill, near the town of Charleville, which he founded in 1661. He died 16th October 1679.